Respect for the uniqueness of each individual is the foundation of THE SPA at Mandarin Oriental Macau experience. With spa therapist combine both ancient and contemporary techniques in a natural manner and emphasis on organic and lifestyle products, They created a sense of place using local ingredients and offer a comprehensive range of spa treatments relating to wellness as we immersed ourselves in a <Spices of Portugal> journey for almost two hours treatment after the consultation and prescription. 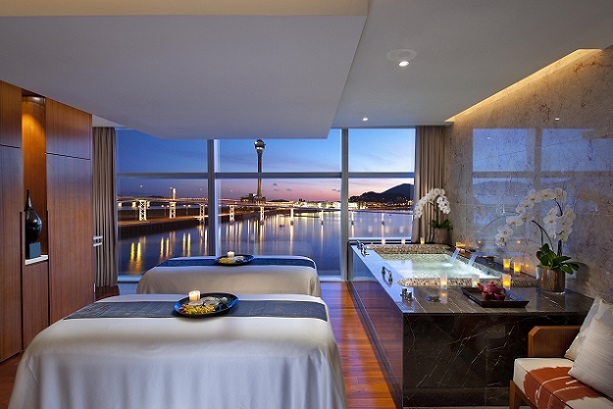 Our <Bamboo> couple suite room is one of the largest room at THE SPA at Mandarin Oriental, Macau. Softly lit rejuvenating experience showers, pampering vitality pools and a crystal steam room allow for peaceful relaxation with a soothing views over the still bay waters. Our journey began with the heat water oasis which a big tub fits two for dissolving stree and soothing aching muscles. 15 minutes later, a foot cleansing ritual that we always find and get us in a more meditative mood for the wonderful experience that lies ahead. Then after this short but important beginning step, we started the full body scrub. This gentle cleansing body exfoliation offers great benefits for the skin, our therapist methodically applied the exfoliating mixture onto the skin and scrubbed it in without any discomfort. Of course, at this point in time it is all about the application, but the full benefits become apparent when you rinse. So, after rinsing off all the exfoliating scrub, you could feel your skin turned softer and rejuvenated, it is very soothing and a truly beneficial step in the wellness journey. This is then followed with a relaxing hot stone massage. The stones have to be heated to a certain temperature to be able to elicit the stimulating and healing effects that this technique is renowned for. Before the application of the hot stones, the therapist deftly performs a preparation massage of the area in question, ensuring that the thumbs give a deep tissue massage on those areas that you have muscle aches and knots. This is then instantly reinforced with the hot stones and it is a very stimulating effect, partly assisted by the use of essential oils of Ginger, Black Pepper and Rosemary. The overall effect is like a deep heat rub that is very satisfying and truly relaxing, after you allow your body to give into the heat of the stones. The last step of this ‘spice’ journey is a relaxing head massage to stimulate and revive the senses. When expertly delivered, this massage is a highlight and our therapist did not disappoint with her expert hands, which occasionally provided some tingling sensations that created moments of ‘nirvana’, so we had reached that pinnacle of stimulating and relaxing pampering. After our pampering, we truly felt that we had found a path to equilibrium in mind, body and spirit, dissolving stress and soothing our aching muscles. The ambience is not as luxurious in interior design that you can find in some other resort’s spas, but the products used, expertise of the therapists and the amenities provided certainly did meet some expectations. Their signature product line has been developed specifically for the group by the award-winning UK based company, Aromatherapy Associates and we love these products a lot, as they contain naturally-derived ingredients that also help to soothe the senses. As part of its responsible wellness philosophy by offering you programs with ultimate combination of relaxation and pampering.